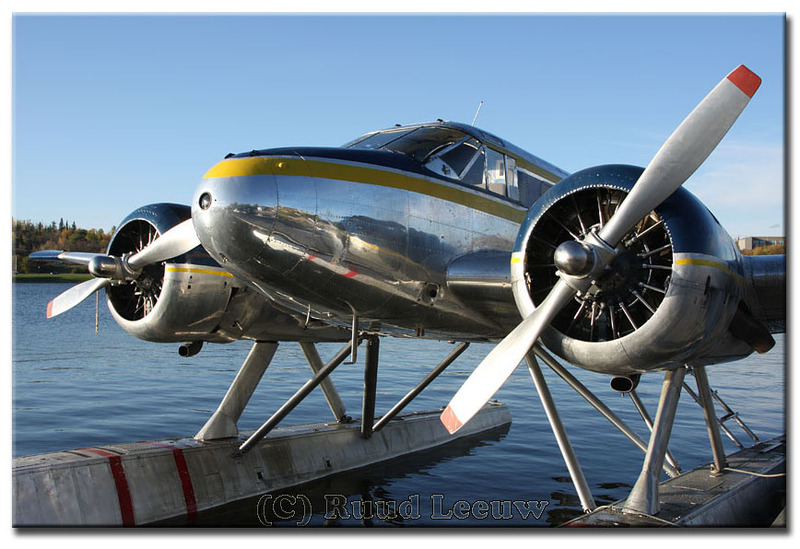 In recent years I have become fascinated by another type of vintage aviation: the bushplanes of North America. 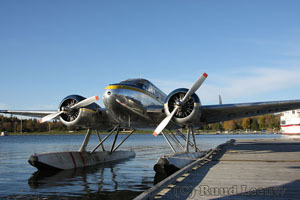 The vintage radials seem to come alive far more often in this trade, than the multi engine transports. The fact that a growing number have been reconfigured to turbine engines does not make them less fascinating to me. 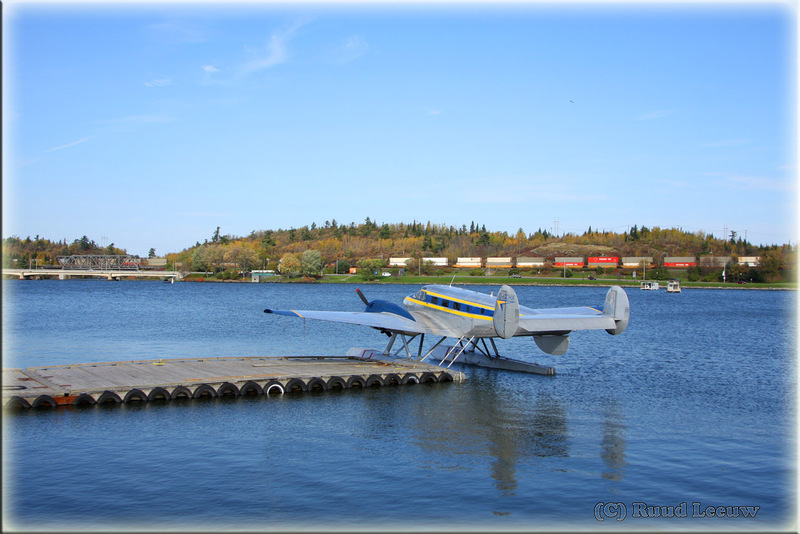 This time my travels took me to Northwest Ontario and starting point was Kenora. When I returned home and looked at Google Maps, I noticed I had not fully explored the airport, part of it hidden by trees from where I stood (at the control tower) and which may explain why I found nothing there. 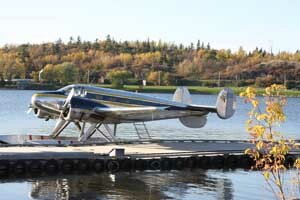 Kenora Air Service is one of two companies to share these docks here... 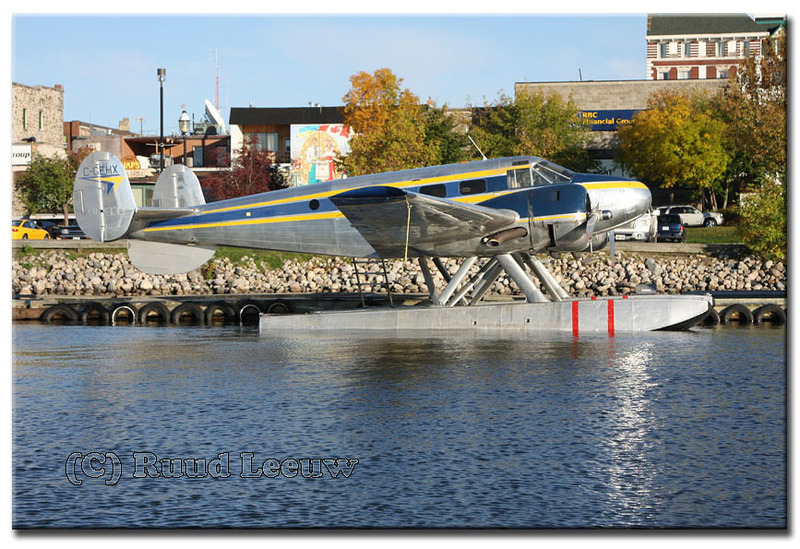 They seem to take the lion's share and River Air use Kenora as a base too. Otter c/n 230 was delivered to the United States Army on 10Jan58 with serial 57-6111 (tail number 76111). It was assigned to go to Europe. By Jan62 76111 was in storage at Coleman Barracks, Mannheim, Germany as a maintenance float. It was issued to a European unit in May 1964 but unfortunately details of its service career over the next few years are unknown. 76111 was one of eight Army Otters, all in storage at Coleman Barracks, put up for sale by sealed bid tender with a closing date of 29Dec71. 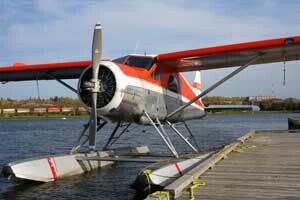 The successful bidder for all 8 Otters was Ferrer Aviation Inc of Miami, Florida. 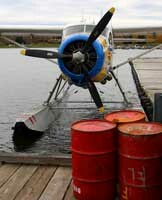 The total price paid for all eight Otters was $303,640 of which $41,600 was the price paid for 76111 which had 3,123 hours on the airframe at the time of sale. 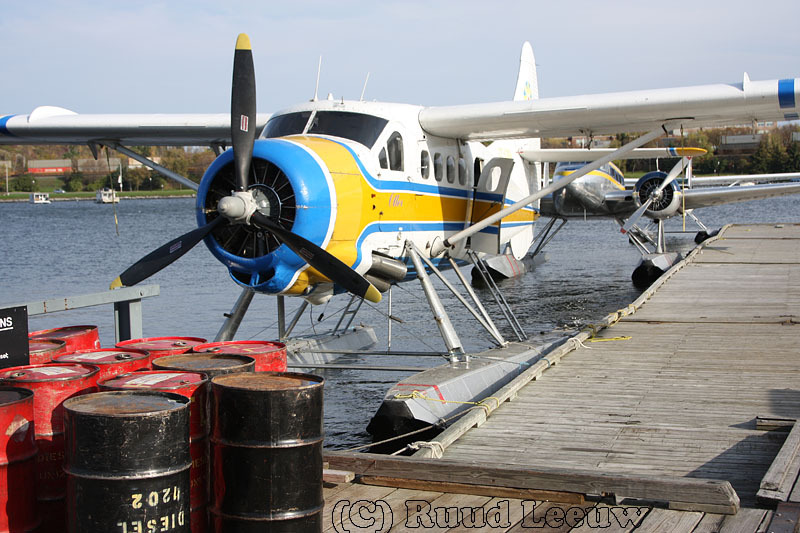 76111 was allocated marks N80941 for Ferrer Aviation, who contracted ferry company Air Convoy to fly the eight Otters to Canada. All followed the same route, two at a time. N80941 accompanied sister ship N80943 (ex 76110), routing from Coleman Barracks to Saarbrucken and then onwards to Ashford in Kent and on to Shannon in Ireland, where they arrived on 07Apr72. Ferry tanks having been fitted by SRS Aviation at Shannon, they continued on to Reykjavik, Iceland on 20May72 and then via Greenland and Goose Bay, Newfoundland to Winnipeg, where they were overhauled and civilianised by Perimeter Aviation. 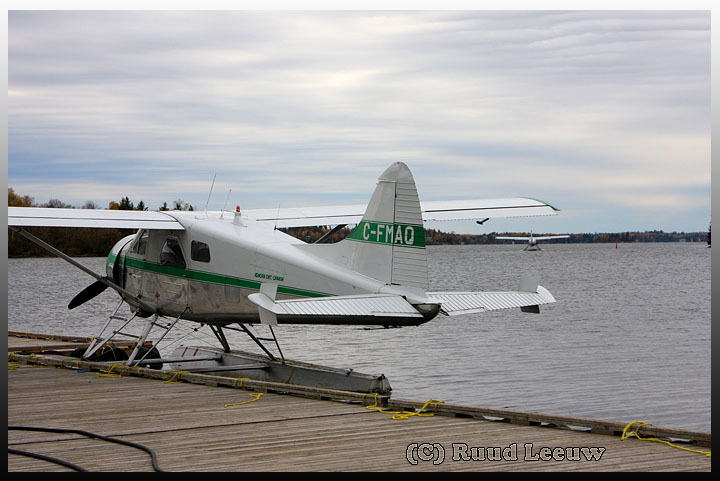 N80941 was sold to Parsons Airways Ltd of Kenora, Ontario and joined their fleet in 1973 registered CF-CBA, later re-registered C-FCBA. 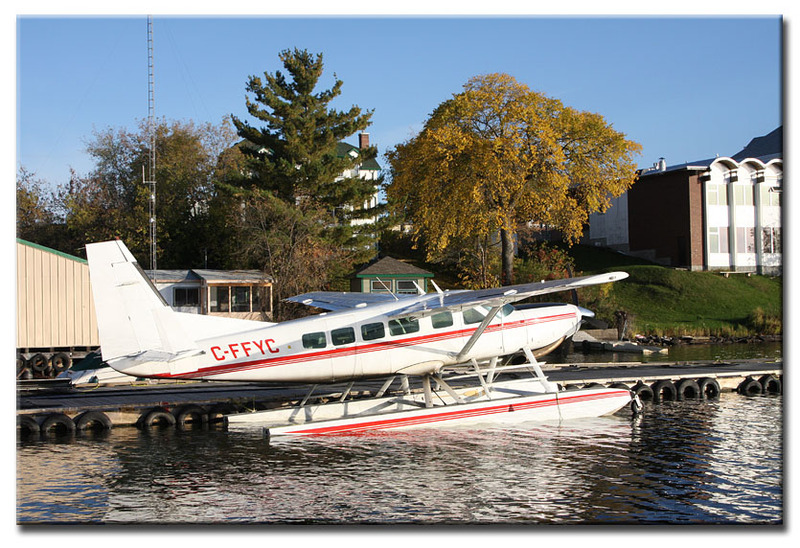 It served with them until sold to Kenora Air Service Ltd in June 1982 with whom it has served for many years, reverting to CF-CBA. 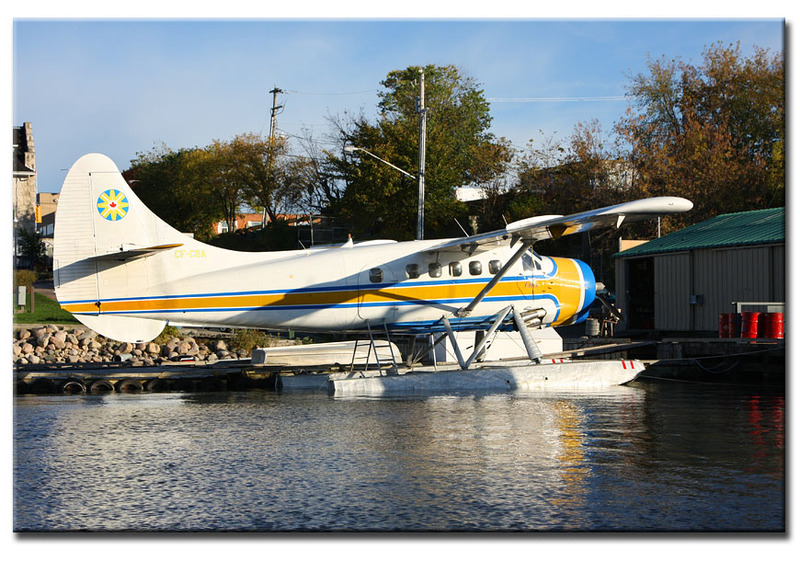 Pity I did not see it fly when I was there, but it was good to see that 25 years after it was purchased, anno 2007, it was still flying for Kenora Air Service. Long may she continue to do so..! 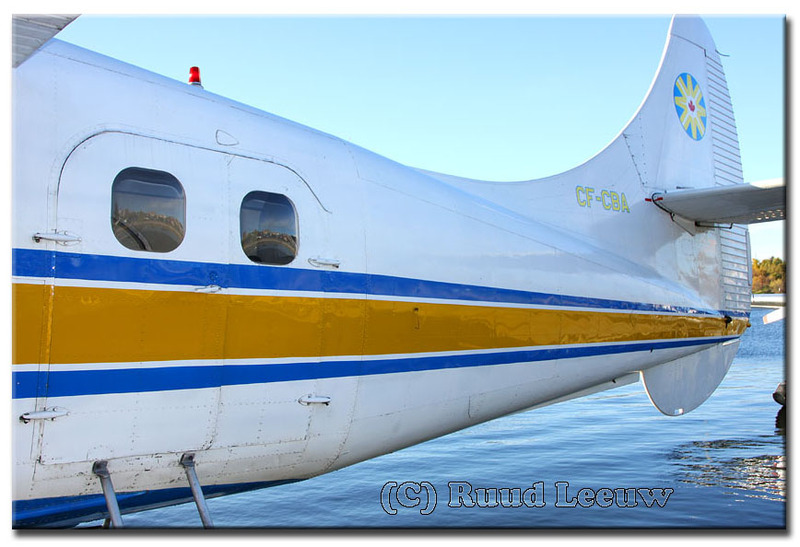 Beech 18 C-GEHX (c/n CA-112) was registered to Kenora Air Service Ltd on 23Aug06. It was delivered to the RCAF as a Mk.3NM on February 27, 1952, on January 14, 1955, as stated by Bob Parmerter: "It was loaned to the RCN, retaining the RCAF s/n 1512. The code 852 indicates it was assigned to the Training Air Group, including VT-40 Squadron." 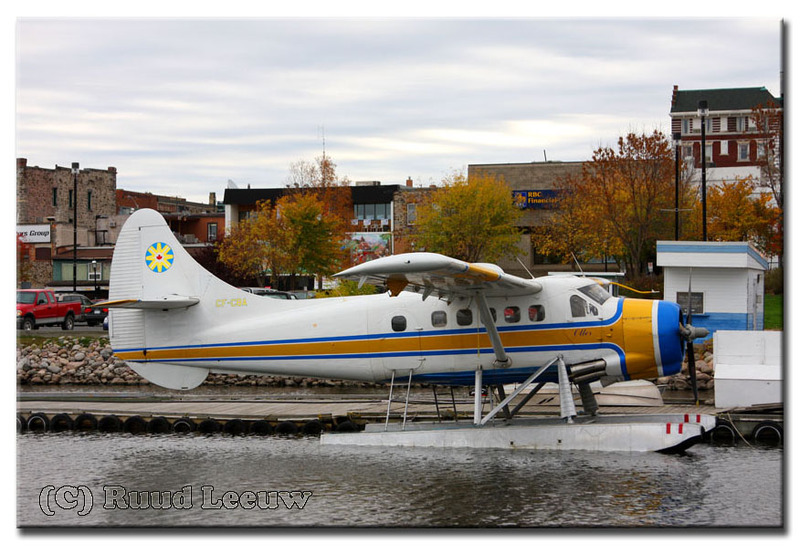 Returned to the RCAF on May 14, 1957, it was converted to a Expeditor Mk.3NMT in March 1963. 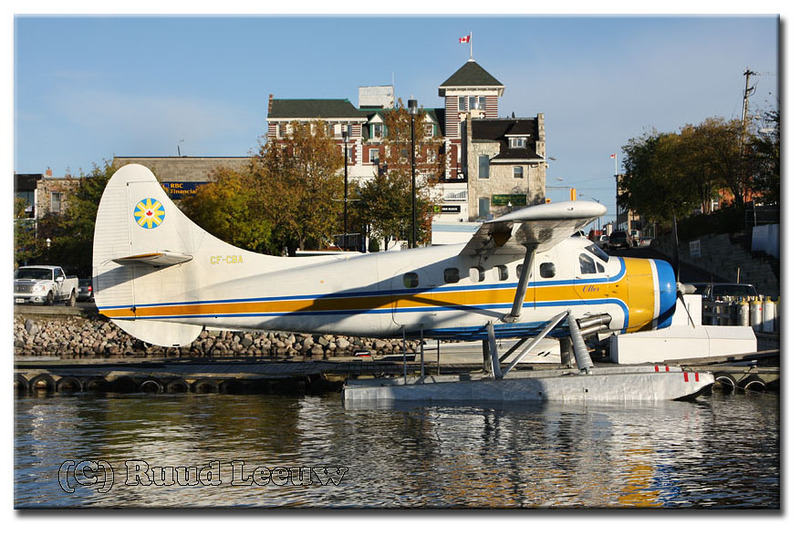 During the integration of all Canadian military services into the Canadian Armed Forces this aircraft was redesignated Beech D18S CT-128 Expeditor and reserialed 5181, on July 28, 1967. It was struck off charge on October 7, 1970. 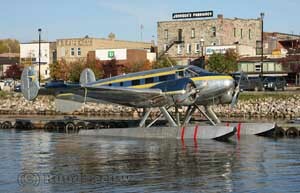 It was subsequently sold to Silver Pine Air Services, Pine Falls, Manitoba, registered as CF-ZNF. 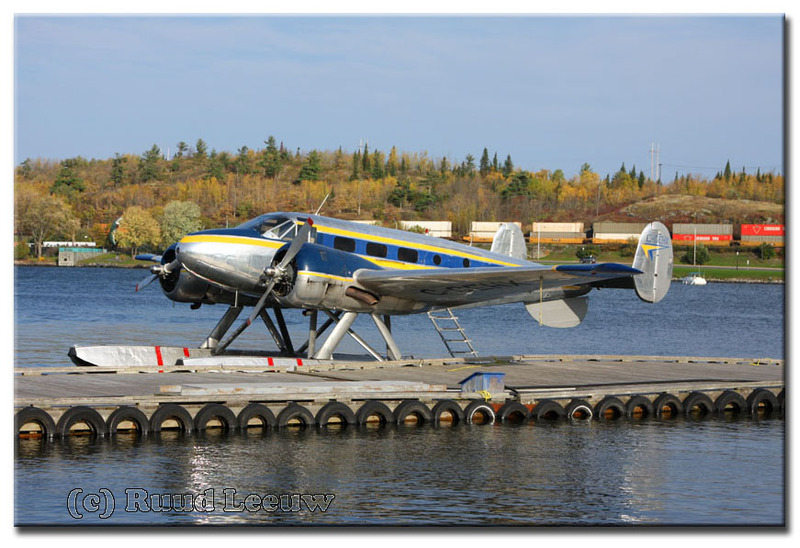 Later it was reregistered to C-GEHX, and from June 23, 1982 it has changed hands 15 times, owners including Services, Minto Airways, North Cariboo Flying Service, Nunasi-Central Airlines, Ontario Central Airlines, Red Lake Airways and Sky-North. 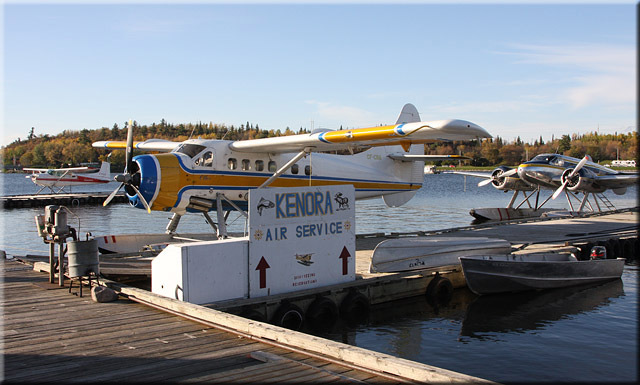 The final sale was registered on August 23, 2006 to Kenora Air Service, Kenora, Ontario. As if time stood still, don't you think? 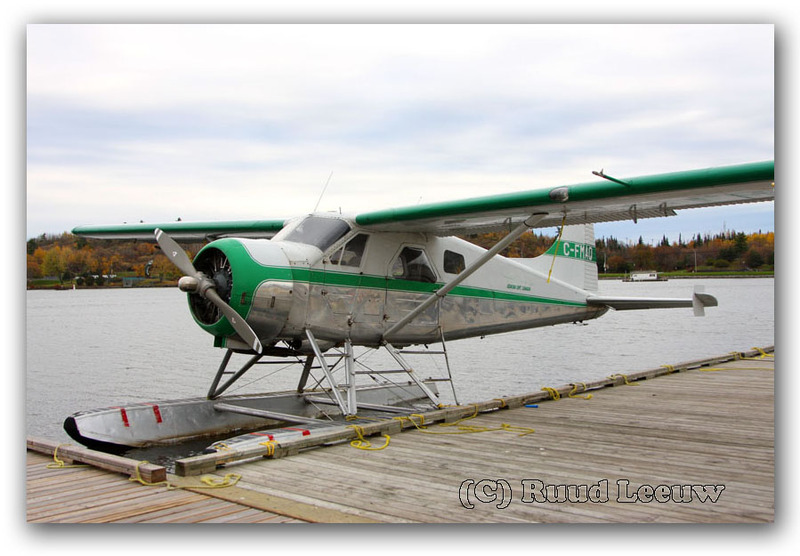 When I saw this one, I must admit I had no idea of what it was... looked like a Piper Super Cub to me, but.... it isn't. 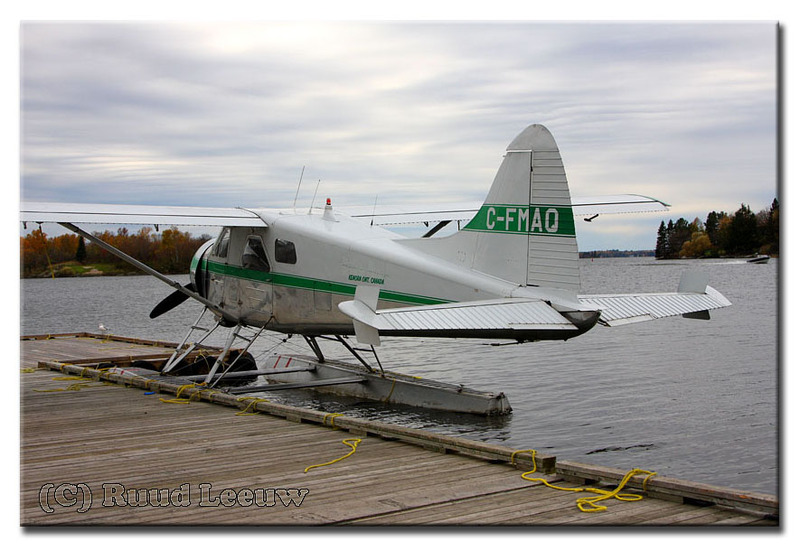 The owner is Greg Smith (dba Pickerel Lake Outfitters, Keewatin, Ont.) and the Transport Canada webpage showed me it was registered on 25Aug06. 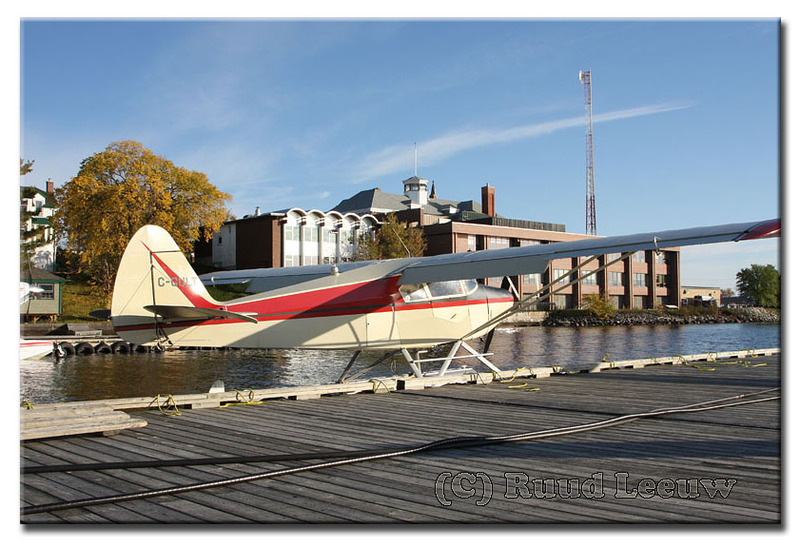 By the same website, the manufacturer of the Eagle 180 was given as Oliver J. Wilcott; this plane, c/n 02, was manufactured in 1988. I would welcome more information on this type of aircraft..
"I am writing to let you know that this is actually a PA-22 Bushmaster. The bushmaster kit has lengthened the wings and fuselage plus put a huge back door in so you can carry almost 700 lbs. 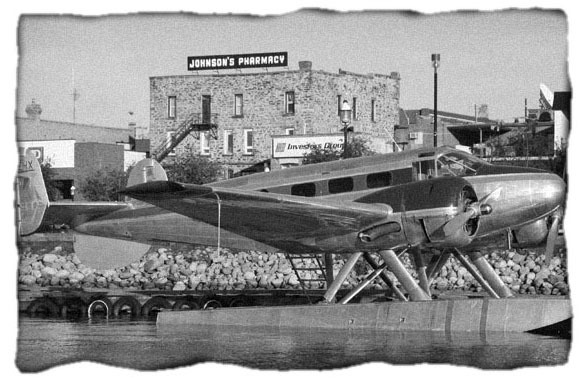 This plane, before we bought it, used to haul wild rice so they actually mounted it farther ahead so they could haul more in the back. We refer to it as a 'Baby Beaver'! 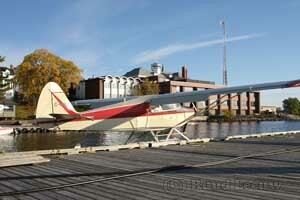 It has a 150 hp Lycoming engine. 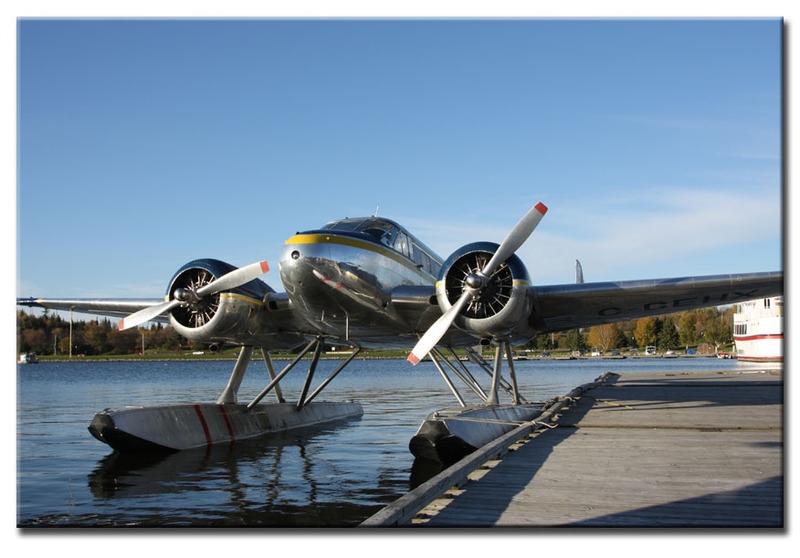 It is normally a four place plane, but we’ve removed the back seat to haul motors and anything else we can fit in!" 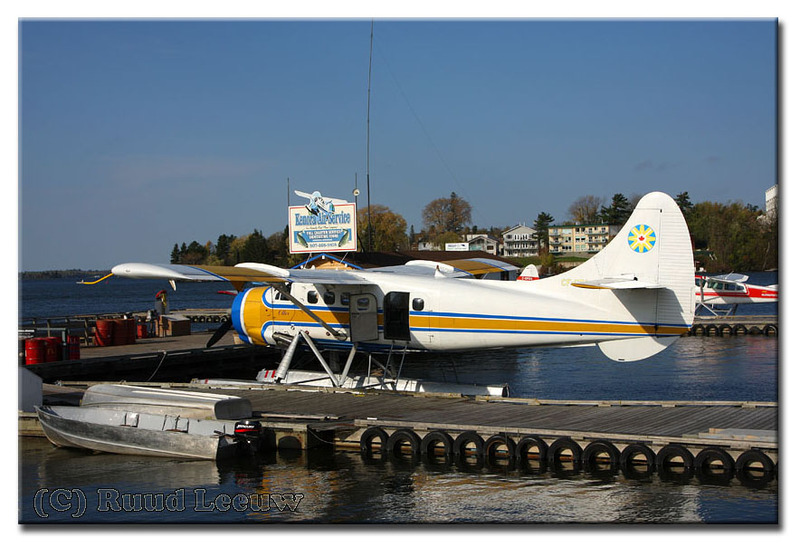 I would find on this trip that this type, the Cessna 208 Caravan (aka Cargomaster), can be found in growing numbers on the docks of seaplane bases. 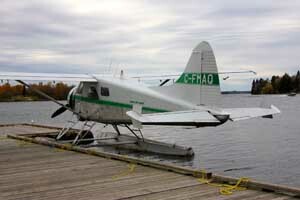 C-FFYC has c/n 20800111 and is registered and operated by River Air Ltd of Kenora,Ont (registered on 21Apr06), but River Air's main base is at a place called Minaki, on Pistol Lake (map). Cessna 208 Caravan on Wikipedia. 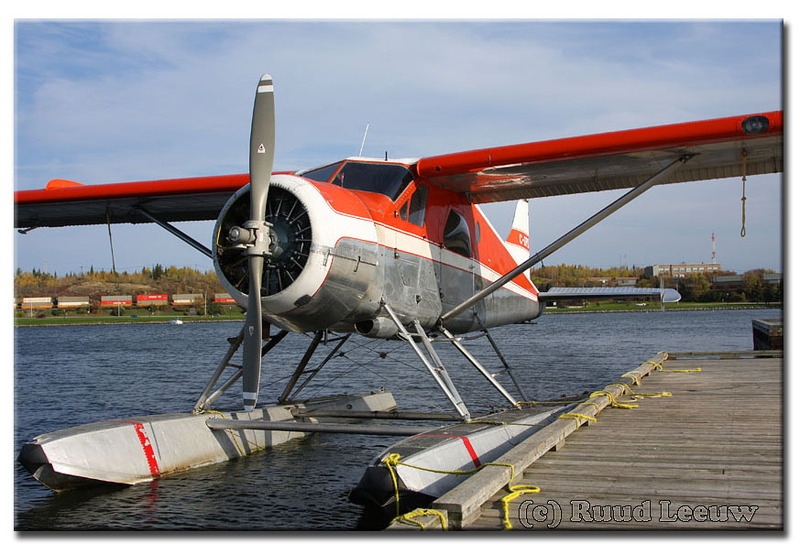 Another Turbine-engined workhorse, but this one has a history equipped with a piston engine too... DHC-3T Turbo Otter C-GYKO has c/n 287 and was registered on 14Jun96 to River Air Ltd. Otter c/n 287 was delivered to the United States Army on 17Oct58 with serial 58-1682 (tail number 81682). The Otter was allocated to the US Army Military Academy at Westpoint, New York, where it was to spend the entire of its military career. It was delivered from Downsview directly to Westpoint. The Otter was operated by the 2nd Aviation Detachment, which also had a UH-1A Huey helicopter, Cessna 0-1 and a Beech U-8D and a U-8F Seminole on strength. All these aircraft were based at Stewart AFB in upstate New York, but operated for the nearby Academy. 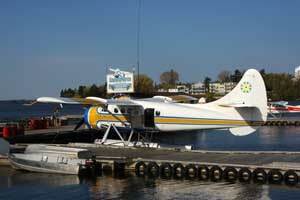 At Stewart, the Detachment had taken over an old Air Force alert hangar, where they housed the Otter and other aircraft. The mission of the Detachment was the support of training of the Westpoint cadets, and for this purpose the Otter flew demonstration flights and parachute drops and flew freight. 81682 was in standard Army olive drab scheme, but sported the Academy crest on the tail. 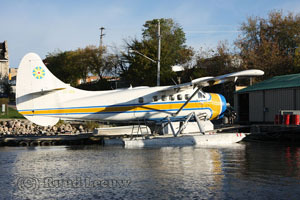 The Otter continued in service until April 1973, before commencing the long cross-country flight to Tucson, Arizona where it entered the storage compounds of the Military Aircraft Storage and Disposition Centre (MASDC) at Davis-Monthan AFB on 10Jun73, being allocated inventory code UA005. It was the 5th and last Army Otter to be stored there and its period of retirement in the Sonora Desert was less than a year. It left on 11Apr74, having been allocated to the University of Tennessee Space Institute at Tullahoma, Tennessee to whom it was registered N22UT in April 1974. The Otter was substantially damaged in a crash at the Franklin County Airport, Winchester,TN on 17Mar75. In the course of a short field take off, during the initial climb in a left turn, the left wing dropped, the aircraft stalled and crashed back to the ground... The pilot, the only occupant, was seriously injured. That ended the Otter's career with the University of Tennessee, although they did obtain a replacement Otter, N2750 (261). 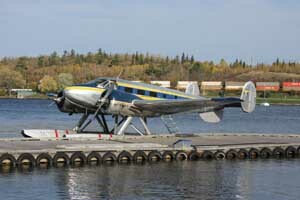 The Otter was purchased by Ontario Central Airlines of Winnipeg, Manitoba who brought the wreck to Winnipeg and rebuilt it. On 24Jan77 a temporary Certificate of Registration as C-GYKO was issued, and a permit to test fly. 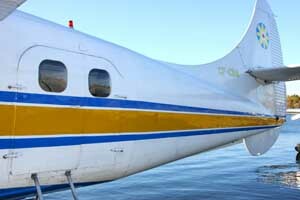 Formal registration to Ontario Central Airlines was on 28Jun77 and C-GYKO entered service, based at Gimli, Manitoba. 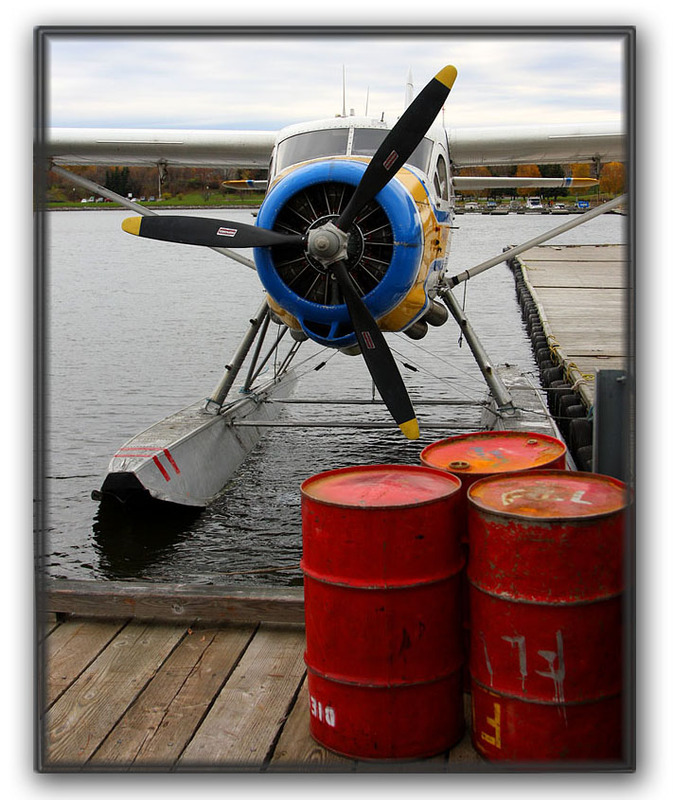 Over the years that followed, YKO has been operated by quite a number of Canadian bush carriers. 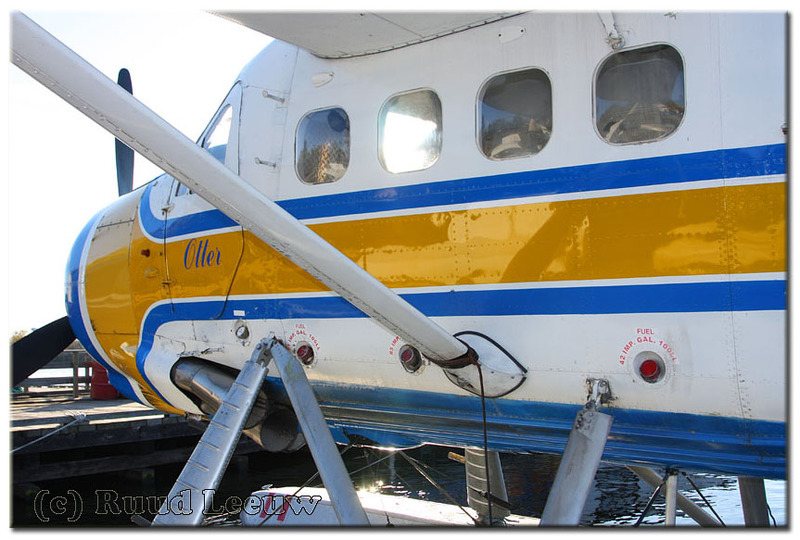 It was registered to Central Air Transport Ltd of Sioux Lookout, Ontario in 1980; Gold Belt Air Transport Ltd of Sioux Lookout in April 1987; Ashuanipi Aviation Ltd of Labrador City - Little Wabush Lake in December 1988 and Alexandair Inc of Sept Iles, Quebec in August 1990. On 05Oct90, while flown by Alexandair, during climb out, at an altitude of two hundred feet, a loss of engine power was experienced. 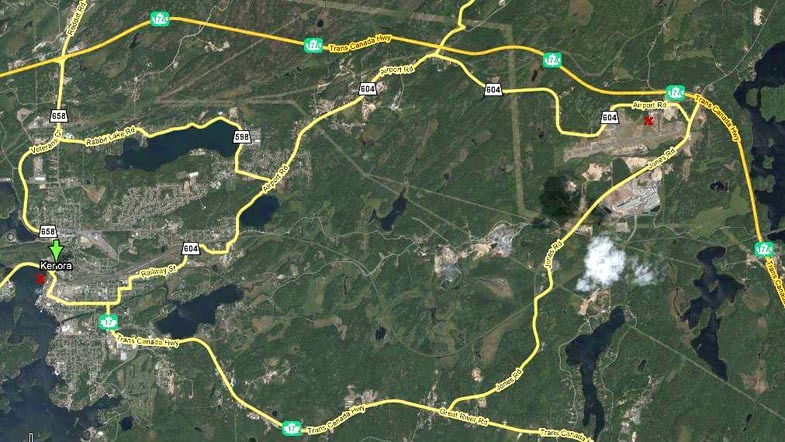 A forced landing was made in an alder grove one mile west of Lac Sale, Quebec. The damage was repaired. 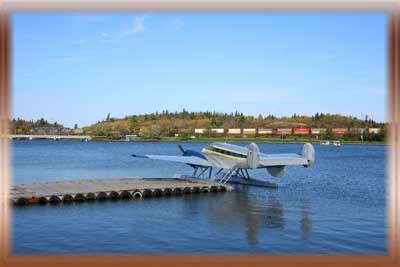 It was again registered to Ashuanipi Aviation Ltd in February 1993 and to Walsten Aircraft Parts & Leasing Inc, trading as Mandair, of Kenora, Ontario in September 1994. 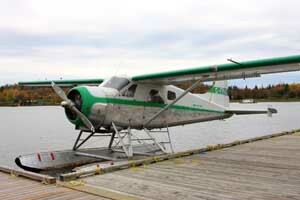 In June 1996 it was sold to River Air Ltd of Pistol Lake, Minaki, Ontario. 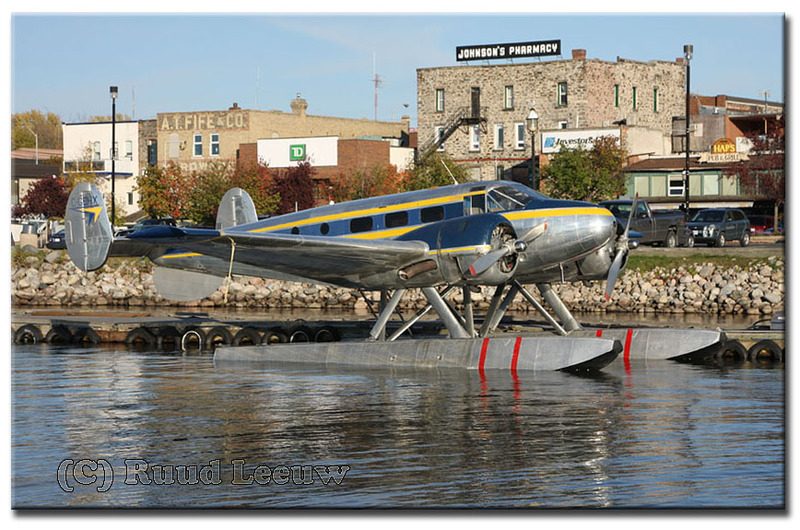 As its website proclaims: "Based in Minaki, just 15 air miles south of the English River, is River Air, the charter service owned and operated by George and Gene Halley. 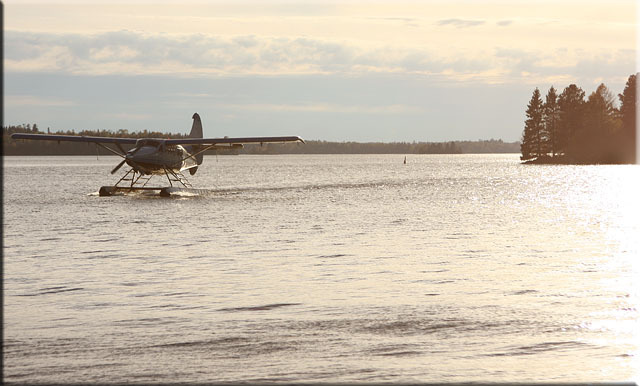 Their red and white planes provide a scenic transport to whichever fly-in camp you are going to. 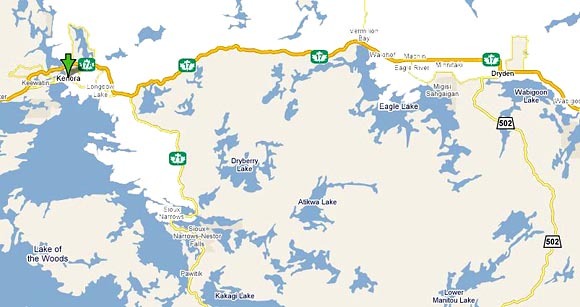 Once there you may wish to arrange a daily fly-out fishing trip for Lake Trout, Muskie or Smallmouth Bass or to one of the more than thirty outlying lakes where we have cached boats and motors". Website. 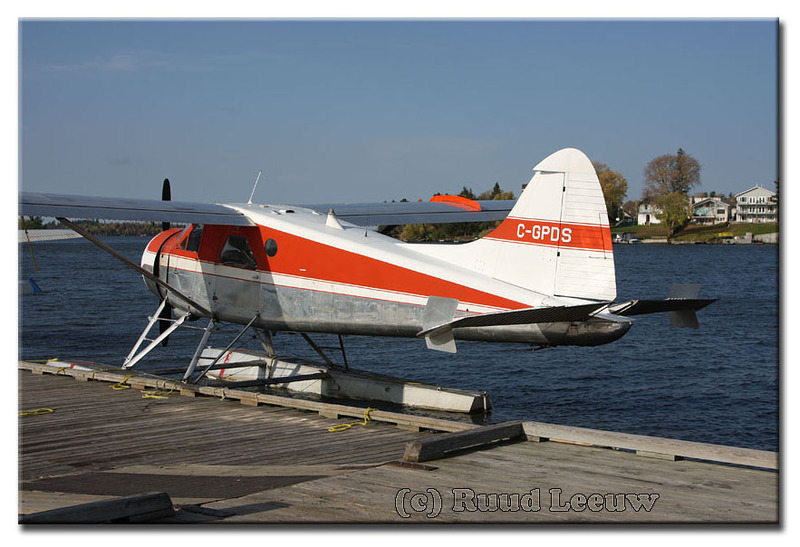 The Kenora docks also offered vintage De Havilland Beaver bushplanes, such as this DHC-2 C-GPDS, which has c/n 1349. 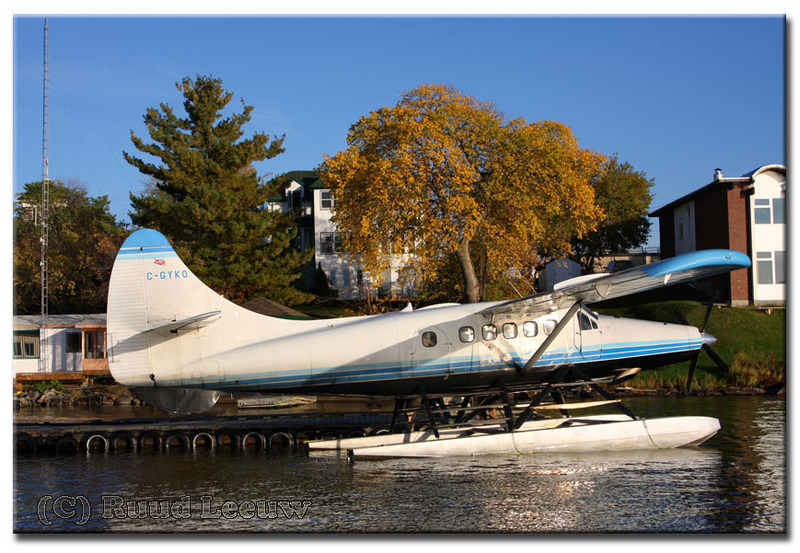 This DHC-2 continued with a civilian career, as N62352 for Island Airlines of Port Clinton,OH but I have no date of its career at that time. The registration was cancelled in Jan86. 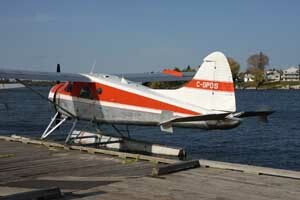 Before that, it was imported to Canada in 1983 and registered C-GPDS in August. I assume subsequent years were spent inactive or under restoration, as River Air Limited was not registered as owner until 23Sep87. Good to see its faithful service continues to this day. Must admit I felt slightly disappointed by my inability to capture moving 'targets', but this was largely due to my intensive schedule: I had arrived in Toronto 12 days ago, spent a few days, flown to Winnipeg, drove to Calgary and returned by way of Saskatoon, drove to Kenora via Gimli & Selkirk, to spend 1 night here.. I was lucky to see a few visitors and the weather cooperated too. 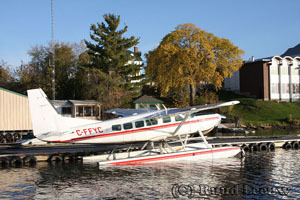 The photos of C-FMAQ were taken on a 2nd visit to Kenora, on 04Oct07, while returning to Winnipeg . 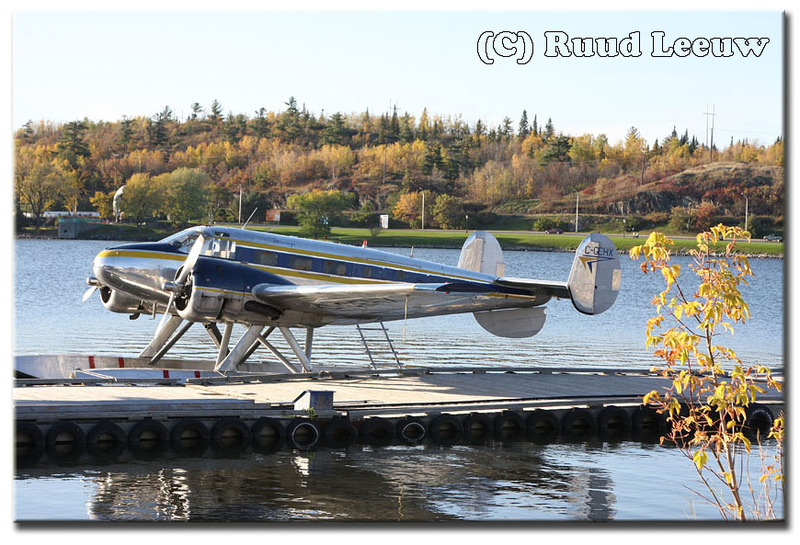 De Havilland DHC-2 Beaver C-FMAQ has an early construction number: c/n 14. 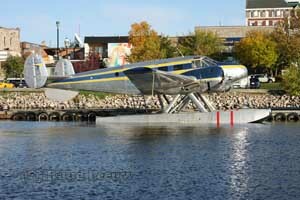 It was delivered on 25Jul48 as CF-MAQ to Province of Manitoba Air Division at Lac du Bonnet, Manitoba. 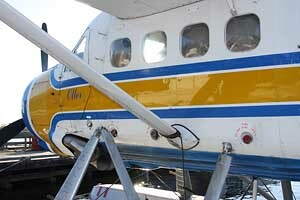 It served with Nipawin Air Services Ltd. of Nipawin,SK circa 1975. 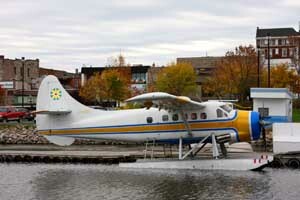 It moved to Parsons Airways, around 1978. 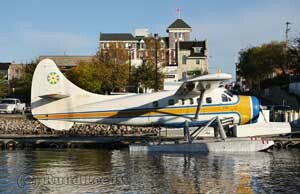 It became C-FMAQ of Neil Carl Walston, dba Walsten Air Services (1986) Ltd. of Kenora on 11May87. 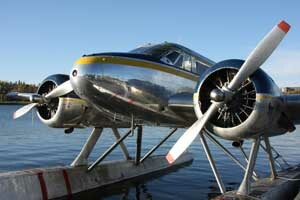 Quite recently it changed owners again: to River Air Ltd it was registered on 25May07. Kuby's Yard : when I returned home I learned from this location and asked around. Here are some of the responses, so others will not miss it! 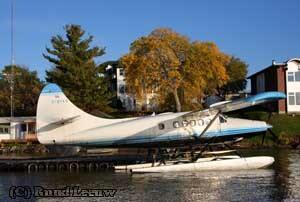 "I have a few pictures of Kuby's Yard at my ON trip report. The last 3 images on http://home.scarlet.be/~tsc85470/ont2006/float5.html and the first one on the following page. We were aware of the yard, so we looked for it and eventually found it, although I don't think there are any road signs. It is not near the airport. 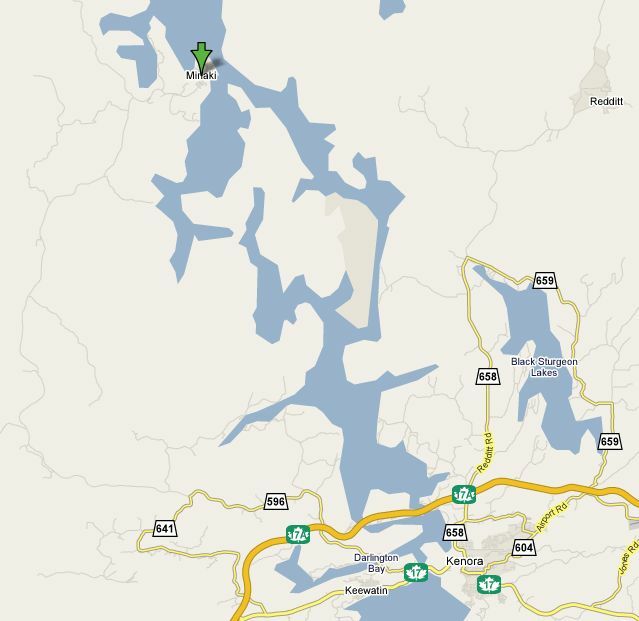 The coordinates in Google Earth are 49°45'11.95 N 94°29'08.52 W. "